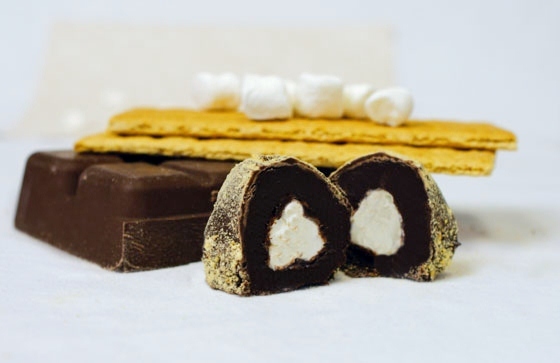 A rich chocolatey truffle with a marshmallow center, garnished with crushed graham crackers - a fine way to enjoy "s'mores"! 1. Chop 1 package of CANDIQUIK® into small pieces, set aside. 2. In a medium sized pan, heat 1/3 cup milk over medium-low heat, until simmering. Once simmering, add chopped CANDIQUIK® and stir constantly until melted. 3. Pour CANDIQUIK® mixture into a medium bowl; place in refrigerator until completely cooled and “fudgy”. 4. Shape mixture into 1″ sized balls. With your thumb, make an indent in the ball and press 2 small marshmallows (or 1/2 of a large marshmallow) into the center. Mold chocolate around the marshmallows to form a ball again and place on wax paper. 5. Melt remaining package of CANDIQUIK® in Melt and Make Microwaveable Tray™ according to directions on package. 6. With a spoon, coat balls completely in CANDIQUIK® and place on wax paper; sprinkle with graham cracker crumbs before chocolate is set. TIP: If truffles become too soft or are not holding their shape while being dipped, place back in the refrigerator for 20-30 minutes.